Known and coveted by thousands of people across the globe, the Great Wildebeest Migration has always been a bucket list experience for almost anyone. It has been featured in books, articles, TV shows, blogs and even movies like Disney’s classic Lion King! But, why is the Great Wildebeest Migration so special? What makes it an ultimate safari experience? The Great Wildebeest Migration is a Natural Wonder. Surely, you’d already have an inkling that this animal movement is a world record. Not only is it the largest animal movement in the planet, it is also coined as “the greatest show on earh” and hailed one of the Seven Natural Wonders of Africa along with its neighbor, Ngorongoro Crater. 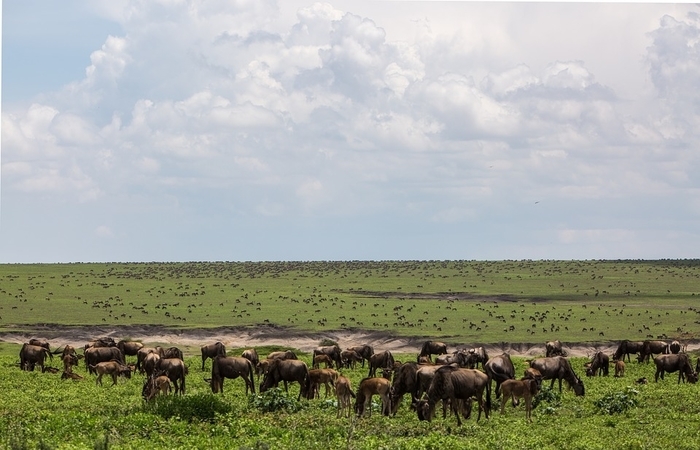 Most people would think that the migration happens only around July to October when the ungulates cross the Mara River. But no, the Great Wildebeest Migration happens all year-round (Check this Migration Map for reference). A cycle that moves in a clockwise manner each year, governed by the rains. It exhibits a mind-blowing number of migrants including 1.5 to 2 million wildebeests, zebras and gazelles split into “mega herds” as they travel from one place to another in search for better grazing and water. Of course, predators will not dare to miss this opportunity and so this event promises plenty of action and spine-tingling episodes. The Calving Season is life-changing. 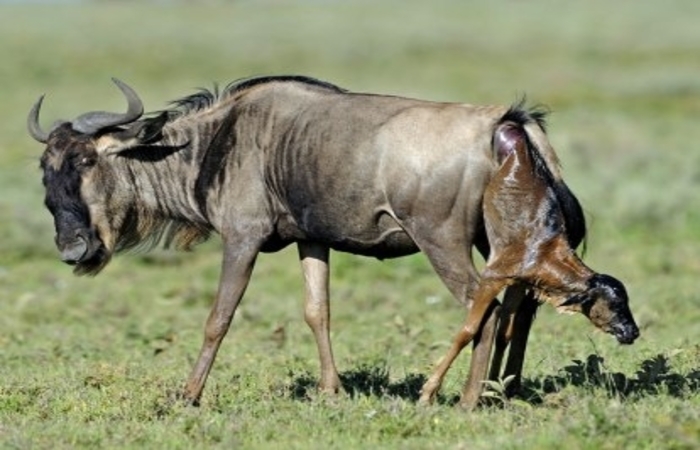 Earlier in the year (late December to early March), about 8,000 baby wildebeests are born everyday. This is called the calving season wherein the herds are settled around the southern Serengeti plains, ready to give birth and train their young to survive. As expected, eager scavengers lurk nearby. From lions to hyenas to cheetahs and leopards, the wildebeest herds start to become very protective of their feeble babies and vulnerable mothers. They barricade around birthing moms, shielding them from potential predator harm. Lion cubs, on the other hand, are being trained by their parents to hunt. 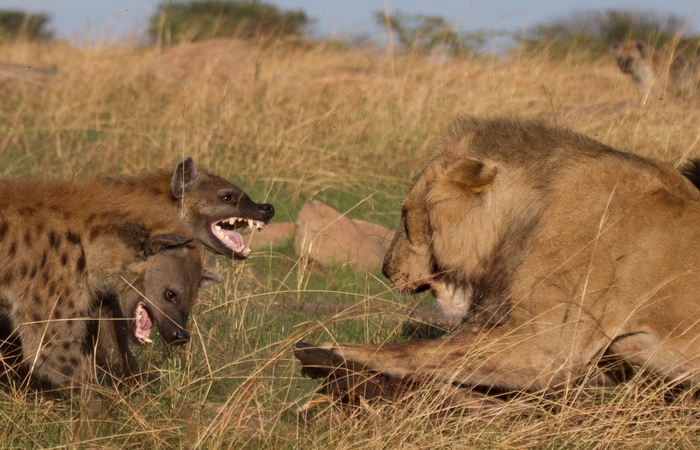 So in addition to adult predators, you can also see tiny cubs being all fierce and mighty, making their parents proud. Hence, predator-prey action during this season heightens in incredible levels. Its jaw-dropping river crossings are a sight to behold; a “survival of the fittest” event. River crossings are one of the most dangerous obstacles for the migrating herds and that is why it has always been a huge tourist attraction. The major crossings during the Great Wildebeest Migration are Grumeti River crossing and Mara River crossing. The Grumeti River is the first water obstacle the herds will encounter. Large Nile crocodiles await and it is a spectacular event to behold as well but because the Grumeti River is not continuous, the crossing of the herds is not as bloody and challenging as what they’re about to face during the Mara River further north. 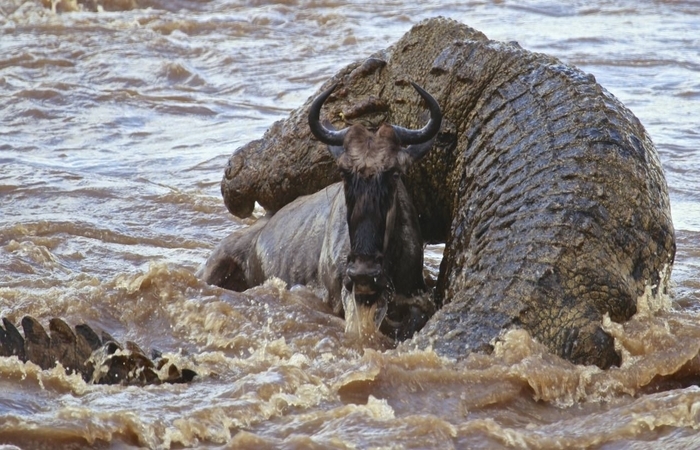 The Mara River is not only deep, wide, craggy and treacherous, it is also home to Africa’s largest crocodile population. So as the herds clamor and struggle to cross the river to get to the good grazings on the other side, the large Nile crocodiles and territorial hippos lay in wait, unfolding one of the most dramatic and chaotic scenes in the animal history of the world. Predator activity during the Great Wildebeest Migration is beyond anything you can imagine. Yes, the crocodiles and hippos by itself are very dangerous foes of the migrating herds. But if you think the rest of the journey is easy, think again. The Serengeti ecosystem holds highest concentration of predators in Africa including more than 3,000 mighty lions that follow the herds. Along with them are leopards, hyenas, cheetahs and other lesser predators. Apart from the action-packed predator-prey interactions, there are plenty of predator vs predator encounters as well. You see, predators are highly territorial. When the migratory herds have left, they don’t leave the area right away to follow the herds’ movement. Instead, they stay for a while. This is where it gets nasty as competition for food becomes brutal and intense, ensuring some of the most thrilling and unreal predators sightings in the world. 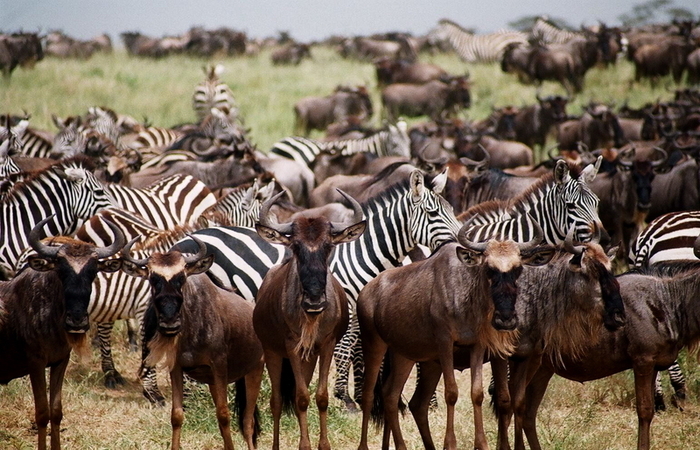 The conformity (and teamwork) of zebras and wildebeests is amazing. Did you know that zebras have a superb memory? This gift comes in handy when it comes to directions and course for the Great Migration. In fact, zebras and wildebeests just naturally have some sort of harmony that they amiably coexist. With the zebras’ incredible memory, they are the ones who remember which way to go during the migration. They are also excellent predator spotters who warns the herds when hungry predators are at large. On the other hand, wildebeests have this fantastic sense of smell that they can find water easily. 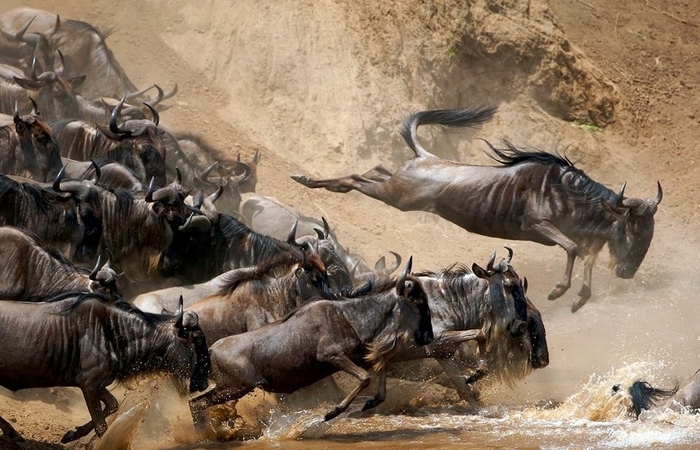 In a nutshell, the Great Wildebeest Migration is an experience like no other.